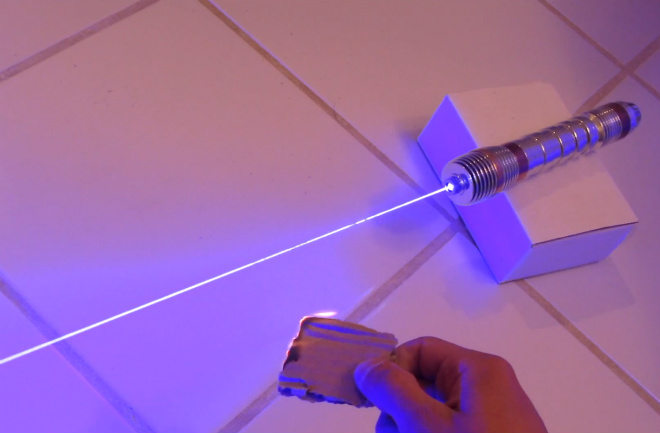 With dreams of owning a real lightsaber of your own, a crazy laser enthusiast has actually built his own Jedi weapon capable of burning straight through things. Extreme hazard labels needed! This 3W laser, built using the diode from a DLP projector bolted to two high-power lithium ion laptop batteries, is capable of burning through the likes of paper, wood, a ping pong ball, and even ignite flammable fluids. Being the most powerful laser this gentleman has ever held, it's fair to say the business end of this goes nowhere near the body or face. So it's not quite the perfect lightsaber you're looking for; but it's as close as we're going to get to Qui Gon Jinn burning through the blast doors in Episode One.